There are four black drawers! As I have stated, I am re-organizing/tidying/tossing as I go through my 52 bead drawers. I approached the four black drawers, three sections each, with enthusiasm, wearing my organizer-in-chief hat. Drawer 22 ended up with all the matte black beads and the shiny ones went to Drawer 23; I am still sorting the next two black drawers, deciding how to proceed since they are black with other colors. I guess I just named them! My discovery in #22 were the meteorite beads pictured above. I thought they were lava beads which I have worked with for several years, but the label said meteorite…that sent me straight to Google. Meteorite is a first for me. As you can imagine, a meteor entered out atmosphere 50,000 years ago, crashed and splintered and lingered, and only 50 years ago, ancient gravesites were found in the Midwest with beads formed from the iron nickel fragments. With the emergence of treasure-hunters with metal detectors, meteorite made its way to bead shows and my Drawer 22. 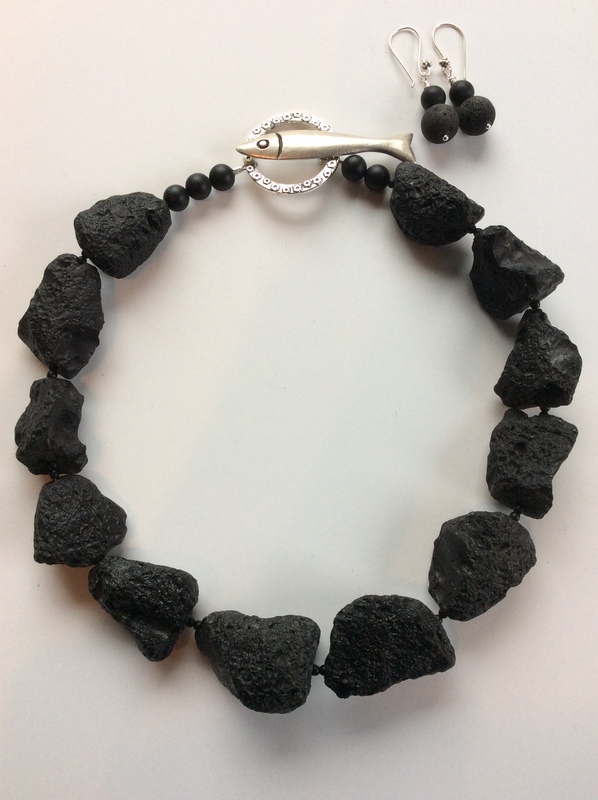 Black and chunky, these beads are coated to protect them from wear and oxidation. I test-drove this necklace and it is comfortable and smooth on the neck. It is of medium weight, perfect for wearing to an event as opposed to all day. It will start many conversations! I added a few matte onyx beads and a pewter clasp to make the back as much fun as the front! Matching earrings in sterling silver, lava and matte onyx. The set is $89. The necklace measures 19.5”. This necklace is intriguing. Would like to see it! I’m in Wellfleet briefly and will be be back tomorrow (Thursday) morning. Are you around the next few days? So glad the fish is getting the attention it deserves! I love having fun with clasps! Another show stopper! The clasp is fabulous and unexpected. Love following your journey; like opening a present every week!